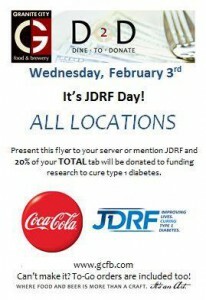 Wednesday, February 3rd it's JDRF DAY! ALL LOCATIONS. Present the attached flyer to your server or mention JDRF and 20% of your TOTAL tab will be donated to funding research to cure type 1 diabetes. Can't make it in? to-go orders are included too!